Four years ago, I bitched endlessly about Red Dwarf X, but I’d like to think that I bitched with purpose. It’s not that the series was bad, exactly. It’s more that it was…instructively flawed. When something worked, it worked quite well. When something didn’t work, all the guts were spilling out of it and it was impossible to resist sifting through them to see what went wrong. Watching those episodes at times felt like performing an autopsy. You’re piecing together what little information you have to try to make sense of why the thing died in the first place. Series X wasn’t doomed to disappoint. The episodes had intriguing ideas. Classic Dwarf setups. Great opening stretches. Erm…decent lighting? And two episodes were…actually kinda good. One of which felt like a genuine classic, and one of which took some time to explore its richest character. “The Beginning” might well represent the beginning of such a rediscovery. It’s certainly possible, because when you brush aside the abandoned plot threads and fragmented bad ideas, there’s a great concept there, and a stellar central performance that promises big things. I know better than to get my hopes up, but it sure would be nice if this show, moving forward, managed to deliver on that promise. Of course, it was a promise that came at the very end of series X, so there’s been a lot of waiting to see if it panned out. And “Twentica,” being the first episode since then, isn’t in a position to answer the question definitively. It is, however, a damned good start. Let’s be frank here: I liked “Twentica” more than I’ve liked any episode in a very long time. X had some good ones, but was pretty mediocre on the whole. Back to Earth was hot garbage. VII and VIII were VII and VIII. But “Twentica” felt…real. Like an actual good episode of actual Red Dwarf, and not as just a nice chapter of whatever experimental form of the show we’re cycling through now. It felt a lot like a series VI episode to me, and I mean that as an enormous compliment. In fact, it seemed to marry the more cinematic visual approach of VII with the strong comedy of the classic years. Shots are blocked interestingly. Sets look good. Wardrobe looks great. Consideration is obviously given to making locations feel unique. It’s something above a standard sitcom, presentation-wise, but for the first time in a long time its comic heart is where it should be. I laughed a lot. Probably more than I laughed in all of X. Not all of the jokes were great, but some of them sure were, and many others were just silly enough (or delivered well enough) to land brilliantly. 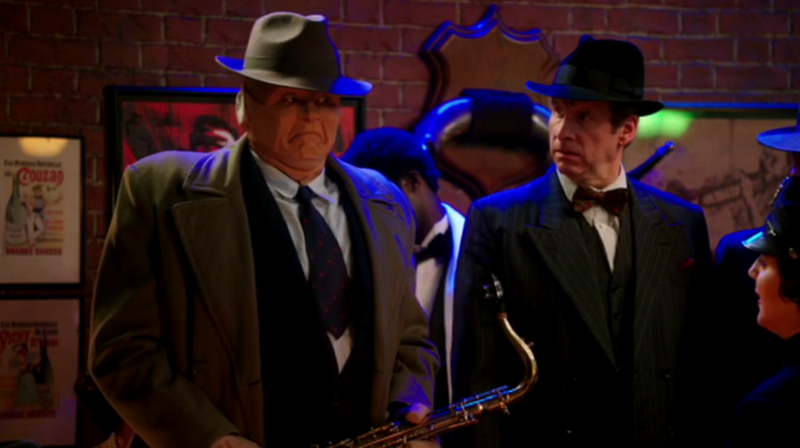 It was surprisingly consistent for latter day Red Dwarf, with only one line (“LEG IT”) feeling forced enough that it reminded me I wasn’t watching a classic-era episode. The concept is perfect for the show, as the crew ends up back on an alternate version of Earth that sees technology outlawed, and the show is more playful with its philosophizing than it has been since…I honestly don’t know. Meltdown? Great Red Dwarf relishes coming up with some kind of germ of an idea (be it a piece of technology, an alternate universe, some bit of philosophy that gets out of hand) and exploring it. Not just presenting it, but pushing it to incredible lengths, just to see where it will take the characters. And we get that here, with scientists hanging around in speakeasies solving theorems, pretending to be unruly drunks when the police come through. The idea that both Kryten and Rimmer are illegal in this society doesn’t lead to much more than a joke or two, but that’s okay, because the story is based less on the characters and more around the alternate history itself, and how the crew intends to right things. I could still pick it apart, but it feels like I’d be robbing myself of most of the fun if I did. And, yes, for once, there’s fun! Tearing into X was the direct result of the fact that I was bored with it, confused by it, and largely unamused by it. I had to question it, because that was the only way I could engage with it. With “Twentica,” there’s enough fun to be had just from sitting back and laughing with it, appreciating great small moments (the kidnapping / hostage negotiation sequence was marvelous), and watching Doug Naylor riff impressively on a genuinely intriguing premise. Jeez oh man was this a far cry from his limp observations about being placed on hold from the last series opener. Every character got at least one great moment, with The Cat probably having the largest number of big laughs. (Is it just me, or has Danny John-Jules gotten better with every series?) Rimmer leaning on his English accent (peppered liberally with the word “whom”) was also a treat. And even the not-simulants (I keep forgetting the proper term) got some great material at the very end, with an unexpected callback to what seemed to be a throwaway line in the opening scene, unraveling their menace for the sake of some very funny (and very human) verbal fumbling. It felt right. The jokes landed as well as they did in the classic years, and I actually found myself thinking about the episode’s philosophy on and off after it ended, which of course is something the show hasn’t given me a reason to do in a very long time. Even the classically-structured closing scene, in which Lister reflects on the week’s lesson, seemed to acknowledge how well this episode stood alongside some of the show’s all-time best. Doug allowing himself a return that kind of scene at the end felt like something of a minor celebration…like cracking open a bottle of champagne to celebrate a night that couldn’t have gone any better. I enjoyed it a great deal. I think X expected us to find too many things automatically funny without working for them (gurning faces, silly accents, MURDERED WOMEN), but “Twentica” hopefully suggests that those days are behind us. It works hard and it works well. Again, comparing it to the last series opener (“Trojan”), it’s clear we’re already in another league entirely. I’ve been avoiding spoilers for this series, but I have watched the trailer. And the trailer looked great. It looked funny, interesting, and full of potential. “Twentica” does a great job of convincing me that I wasn’t just being optimistic. For the first time since series VI, I’m strongly looking forward to the next episode. And that’s something I definitely didn’t expect to say. Just watched the new episode of Red Dwarf. A few funny lines but a lot of it missed the target. It was overly complex and too Star Trek Next Gen’. All of the characters have become their own clichés. I was really hopeful. Series 10 was a small but significant step in the right direction after the terrible Series 7, 8 and the Dave Special. But it’s just fallen off a cliff! Red Dwarf was always at its best when it was 4 guys and Holly having simple AND FUNNY adventures on the ship. When the plots were complex, it never came second place to the comedy. This is probably the worst episode of Red Dwarf I’ve ever seen. Oh, and Craig Charles’ disturbingly-thick hairline was the funniest thing. He has a better head of hair than he did 25 years ago. This isn’t a Young Hyacinth review. Since Back to Earth I haven’t been to say whether I like or dislike RD episodes as a whole but it didn’t feel like enough time was spent on Twentica’s Earth compared to, say, Back to Reality (though I would like to see more) or Tikka’s. Oh great, another “alternate” earth episode. I was only surprised to see that ace rimmer wasn’t shoe horned into it, since the recycling of old concepts seems to be all this show has become good for now. If they ever run out of ideas, they only have to come up with another “alternate” earth episode, or have Craig whine some more about Kochanski. Or throw Dwayne and Ace back out to predictable bored sounding cheers, like the bored sounding muffled cheer that broke out when Danny tap danced in Twentica. The sound the crowd made is a good metaphor for how this show is going……and its going through the motions. And just like the cheer for Danny’s dancing in Twentica, it feels like people are being forced to laugh at old jokes out of loyalty. In fact that cheer almost sounded like a groan to my ears. Rimmer being duplicated. Dead move. Rimmer getting promoted and acting like a tool. Dead move. Lister having body parts removed. Dead move. ……by a rogue entity designed by humans. Dead move. Alternate Earth story. Dead move. Aknowledging that Danny dances. Dead move (this is not a variety show,, and its not an audition for Strictly…). Having starbug crash into yet another planet. Dead move (dont worry, it will turn up unscathed in the next episode, everybody knows there is a limitless supply – the deadest move of all). In fact it might be hilarious for the writers to acknowledge the limitless starbug joke and actually have the characters spend an entire episode repairing the damn thing for once. The warning light on starbug declaring “not alert”. Dead move. If you cant improve on changing the lightbulb dont bother, an indication of how unfunny the show is becoming rehashing old jokes in unfunny ways. Face it, moves move, and Red Dwarf is treading water so much now, the water has turned into mush. But apart from that, I’ll do an impression of everybody else and say its the greatest series ever, and a return to old form (by the way that phrase is becoming a dead move, if returning to old form is just another way of saying “rehashing old jokes”. In the first three seasons, this show actually used to be quite deep. It really did feel like Lister was the only human being alive. It really did feel like he’d bee abandoned in space. It really did feel like he was alone. That was when Red Dwarf was forced to rely on being a character comedy. Then it turned into, monster-of-the-week and finding out that not only is Lister not alone, that the universe is actually more teeming with life than it ever was. For me, thats when this subtly-intelligent comedy died. And thats also when most fans think the classic series were. The classics were 1-3, after that it was just rehashing dead moves. Not much has changed, but since they’ve slapped a nice shiny glossy HD lick of paint on it, everybody thinks its a reborn genius again. It’s not, its dead moves coated in HD. The only thing new about the show is the god awful production values which keep hitting new lows, same with the writing, and the scripts.